store chemicals, smelly old sports equipment, and other stuff you never look at. Regardless of all the cool stuff you can do in your garage, it’s… still a garage. And nobody wants to create a unique space in a hot and stale room. So how do you keep it cool? One of the best ways is by installing a garage fan, which not only brings in cool outside air and moves hot air out, but also replaces stale air with fresh air so you remove fumes, odors and impurities. So you’re able to spend time in your garage safely and do everything you’d like in comfort. There are three different types of garage fans, and the one you choose depends on your type of garage. If it has an open ceiling, you can use a roof-mounted fan that pulls the hot air out your roof and pulls cool, outside air in through vents in your garage. The second option is if you have a living space above your garage, where you can use an interior-mounted fan that mounts to a side wall and pulls hot air out as it replaces it with cool air. 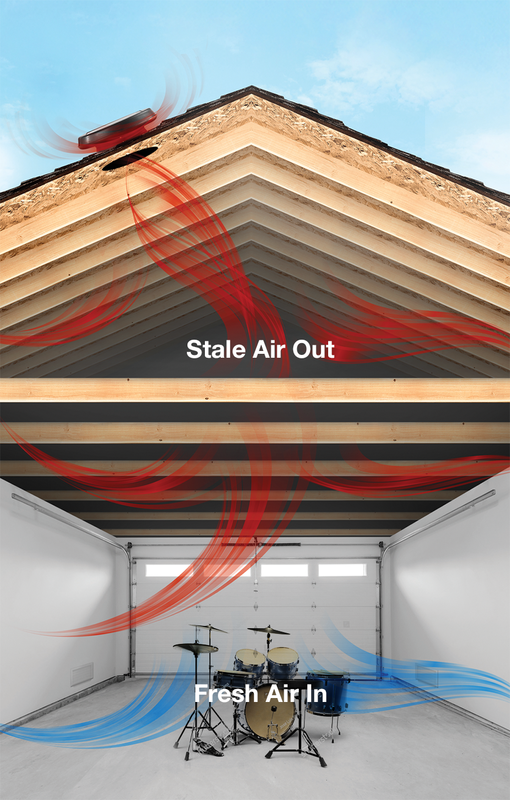 The final option is if you have an attic above your garage, you can use a powered fan that pulls hot, stale air from the garage and attic and pushes it out attic venting, while bringing cool air in through vents in the garage walls. Solatube, a leader in home ventilation solutions, offers all three types, including solar-powered versions for roof-mounted or interior-mounted fans, which keep costs to operate them down as they run during the day. (And saving money is always cool.) Solatube can come provide a free consultation at your house to determine what’s best for your home’s layout, and can even install the same day, often in less than 2 hours. If you’re interested in keeping a cool and fresh garage, call 888.SOLATUBE or visit Solatube.com to find your local dealer.